OK, so first of all what is a wet palette and why do I need one? 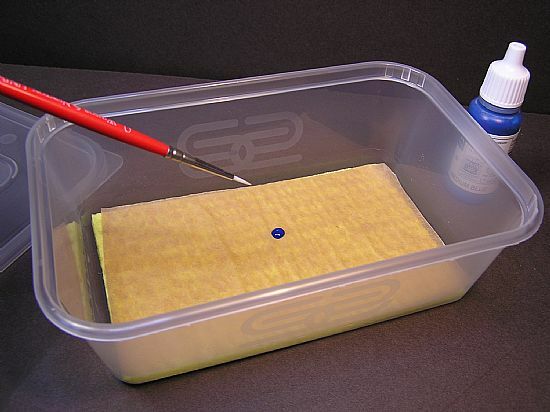 The majority of miniatures painters use acrylic water based paints of some description. My preferred brands are the Foundry system, Vallejo and Coat d'arms. Acrylics are great, they are vibrant,opaque and fast drying, so well suited to our needs. On the down side the fast drying time can mean a lot of wasted paint. You should never use paint straight from the pot. In fact, you can't do this with Vallejo paints anyway, as they are dropper bottles, so for this brand in particular a palette is almost essential. 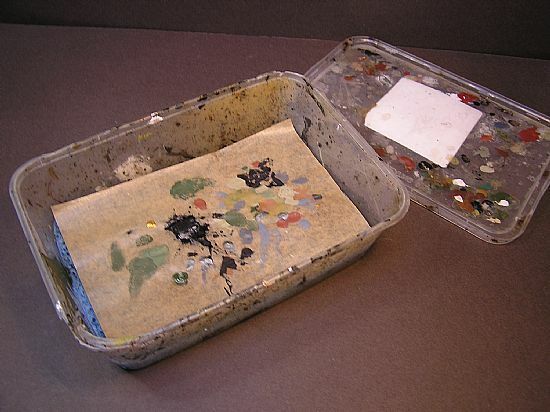 Small amounts of paint should be placed on a palette and used from there. I usually thin it with a bit of water and acrylic flow improver but only as necessary. I don't adhere to the percentage mixes of thinner to paint you will read about elsewhere. I usually add a drop of thinner on to the palette and feed it into the paint with my brush as needed. The problem is that a standard palette is dry and so a dispensed drop of paint will dry fast even with thinning.This is where the wet palette comes in. Paint dropped onto the wet palette will stay workable for a long time. I have even left it overnight and found the paint still workable the next day. 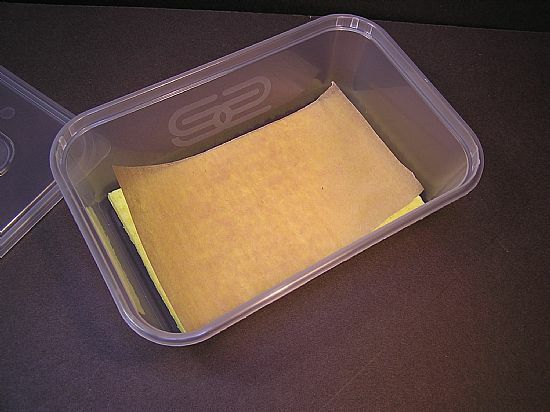 STEP 2: Cut the sponge and the Baking paper so that they fit the container. 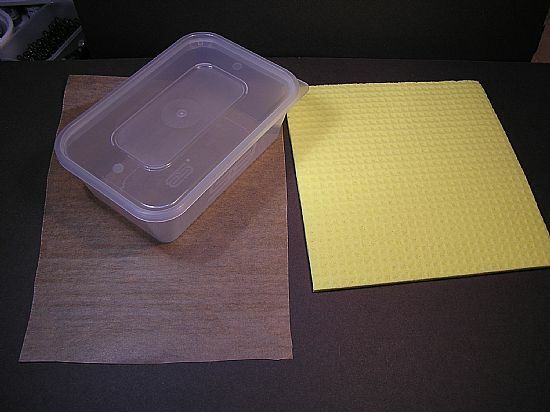 STEP 3: Saturate the sponge with water and lay the baking paper on top. To start with it will want to curl up. 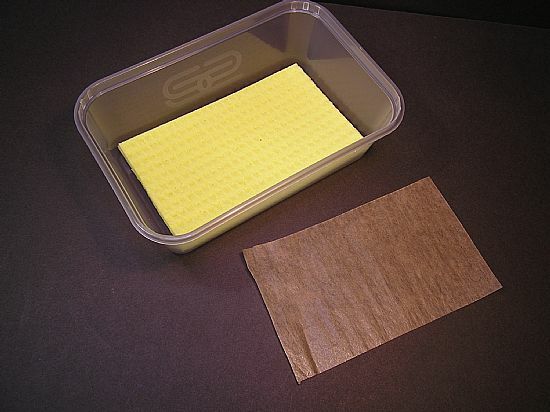 STEP 4: Once the paper takes on some moisture and lays flat, it is ready to use. STEP 5: Small amounts of paint are placed onto the palette for use and thinned if necessary. 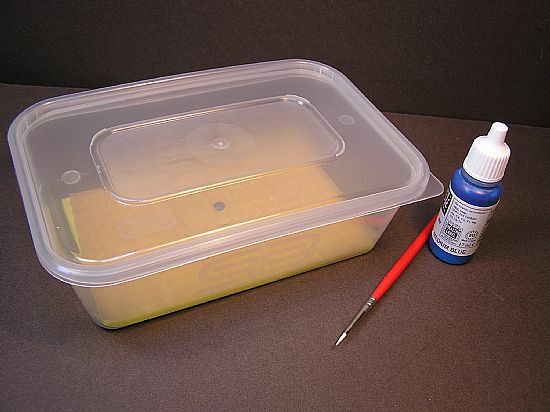 STEP 6:If you need a break or you have finshed painting and still have wet paint on the palette, put the containers lid on to make it last even longer. This is how a battle hardened wet palette will end up looking. They last for ages! 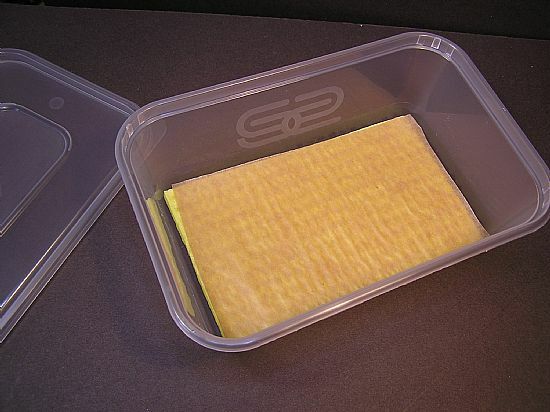 Periodically you will need to change the Baking paper for a fresh sheet and add water to the sponge.